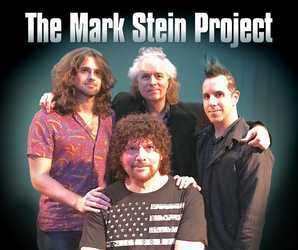 As previously discussed on this site, legendary Vanilla Fudge singer/keyboardist Mark Stein recently launched his latest band, The Mark Stein Project. With an eclectic and celebrated 50-year career fueling his current set list, Stein hit the stage at the Bull Run Restaurant in Shirley, MA ready to deliver a performance that showcased his vast presence in some of the most memorable music in Classic Rock history. Audience members who might have thought the 70-year-old Stein would have mellowed with age were hit with a sonic ton of bricks in the form of show opener “School’s Out,” a song he first played live on tour with Alice Cooper in the late ’70s. While the original track is extraordinary on its own, Stein and his onstage cohorts took it in a fascinating new direction via an unexpected Funkified mid-section arrangement. Switching gears, the group followed up this rousing first number with a gorgeous performance of Dave Mason’s 1977 hit “We Just Disagree,” which rightfully earned an enthusiastic response from the crowd. It only took the first two songs of the set to prove that Stein’s magic touch has impacted a variety of musical styles over the years. Sadly, not everyone who has graced the stage or studio with Stein throughout his career is still with us. He paid tribute to fallen Deep Purple guitarist Tommy Bolin with a brilliant cover of “Dreamer,” while the late Keith Emerson and Greg Lake were honored with an extraordinary rendition of “Knife Edge.” Stein later displayed his love for Deep Purple with the set’s inclusion of “Smoke On The Water” (complete with a story of how he once ended up performing the song with the band on stage in Florida). Naturally, fans of Vanilla Fudge did not leave disappointed. “Season Of The Witch” and “Take Me For A Little While” were delivered with great aplomb, while The Mark Stein Project’s version of the original Vanilla Fudge’s immortal rendition of “You Keep Me Hangin’ On” served as a reminder of just how much those four musicians accomplished at such a young age back in 1967. While it was a pleasure to experience Stein’s trip through time, the true highlight of the show was “Let’s Pray For Peace,” a more recent composition that proved that his singing, songwriting and performing chops have not diminished one iota after decades on the road. Like any great bandleader, Stein allowed his fellow musicians to shine in their own well-earned spotlights. Drummer Charlie Z. (Joe Lynn Turner/Jordan Rudess) filled the air with a tom/double bass –heavy drum solo that at times rivaled Vanilla Fudge’s Carmine Appice, while Jordan Steinberg‘s skills on the bass were matched only by his stellar turns on the mic (including a jaw-dropping vocal turn on “Smoke On The Water.”) Guitarist Mark Hitt – an acclaimed journeyman who’s worked with everyone from John Entwistle to John Bonham – took center stage for “Jolly Roger,” a beautiful tribute to the incomparable Roger McGuinn. Trends in the music business come and go, but a great song lasts forever. The Mark Stein Project has a night full of them. See them live as soon as you can.